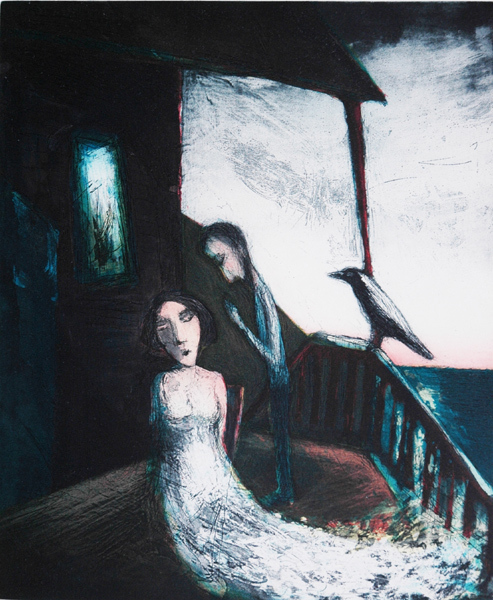 A Garry Shead fine art etching titled “The Last Muse” is a special limited edition fine art etching print released in 2008, the work is of great significance as it represents the passing of Judit Shead. Judit who was the artists Muse, lover, wife, friend and above all his greatest inspiration. This is not a sad image or a sad moment just a moment in time. Garry has openly said he had several lifetimes in one with his Muse, Judit. There is a segment in the Etching House web site dedicated to Judit Shead, (Go to the Artists page) you will see a dedicated page to Judit Shead. When you know which one it is, you will know what to do for that person. They have come to assist you through a difficulty, to provide you with guidance and support. They may seem like a god send and they are. Then, without any wrong doing on your part or at an inconvenient time, this person will say or do something to bring the relationship to an end. Sometimes they die. Sometimes they walk away…..
What we must realize is that our need has been met, our desire full filled, their work is done. Believe it; it is real, but only for a season.